Last night I went to my first focus group. It was for Carolina Pad, the same company that sponsored my Hot Chocolate giveaway. We were there for 2 hours discussing notebook design and functionality. For our time we each received $30 and a cute gift set of products. It was fun and who doesn’t love swag?! You know I love office supplies so I can certainly chat about them. I hope to do some more of these soon! Awesome! Sounds like fun. 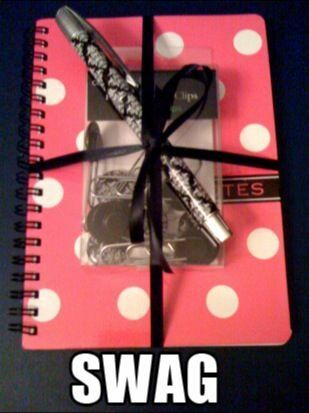 And yes, who doesn’t like swag?! I registered on Carolina Pad’s website & they send me emails when they have focus groups. They are doing another one in a couple weeks but I’ll be out of town.